The International Day of Non-Violence that was marked globally on October 2 gave another occasion for some local figures to raise their concerns over increasingly “violent” television that they say twists the minds of the public. Five years ago the UN General Assembly set aside a day, the birthday of Mahatma Gandhi, leader of the Indian independence movement and pioneer of the philosophy and strategy of non-violence, to bring the world’s attention to problems of eliminating violence. 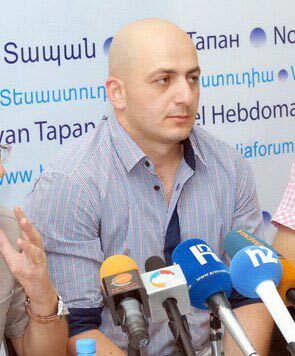 Vahram Mirakyan, a researcher at the Yerevan State University’s Armenian Studies Research Center, used the occasion to meet with journalists on Wednesday to talk about his concerns about the state and quality of Armenian television. The scholar contended that sometimes aggression that later turns into violence has an acquired nature and is contingent on several factors that exist in close surroundings as well as propaganda. Mirakyan thinks that television now constitutes a major cause of intra-communal violence in Armenia. “Television channels show patterns that people are prone to copy. ‘Aggressive production’ is offered on prime time television in the form of films containing violence or scandalous reports,” said Mirakyan, noting that a 2011 survey showed that 30 percent of Armenia’s population spent 7-12 hours and 50 percent spent 3-5 hours in front of TV sets a day. The researcher said that he was particularly concerned about the quality of TV serials that attract the largest audiences and advertisers paying good money for commercial breaks. Several months ago along with a group of several other scholars and representatives of public organizations Mirakyan signed a letter addressed to President Serzh Sargsyan regarding the “alarming” TV production, in particular the quality of TV serials. They solicited intervention by the head of state to resolve the problem. “The [president-affiliated] Public Council is now looking into the matter. It has gathered proposals from different creative unions, intellectuals and soon there will be a broad discussion around these proposals and a final plan will be submitted to the President,” said Mirakyan. TV producers, meanwhile, respond by saying that they are merely depicting real life in serials and films, trying to expose major problems of the society. Another group of critics opposing the reforms on TV are liberal scholars who, while often agreeing with the assessments of television as being a low-quality enterprise, still abhor any interference on the part of the state in what is supposed to be an independent and creative environment. Mirakyan, meanwhile, thinks direction is needed as television fails to properly address public concerns, but instead presents violence as a social culture. “In fact, they generalize the real life of only five percent of the population and project it on the rest of our society. According to a recent monitoring of 22 episodes of one serial, murders take place in eight of them, kidnapping is present in four episodes, and violence is used against police officers in five,” said Mirakyan. While acknowledging that people have always been interested in crime stories, eroticism and backstage, the scholar still called for an alternative to all that to be made available. Doctor of Psychology Samvel Khudoyan, meanwhile, also spoke about the absence of cartoons that would teach kids something “good”. “I can’t remember any good cartoon made recently. All cartoons are based on aggression, which has a negative effect on our growing younger generation,” he said.